Also in this matter, preparation is key to success! Here are some tips that can help to make your Moovly training sessions successful. Moovly is an online application, so a proper internet connection needs to be available to every user. If available, wired Ethernet connections often still perform better than a wireless network. Also avoid that all students start uploading media at the same time: if everyone uses the (usually limited) internet upload connection at once, bottlenecks may occur. 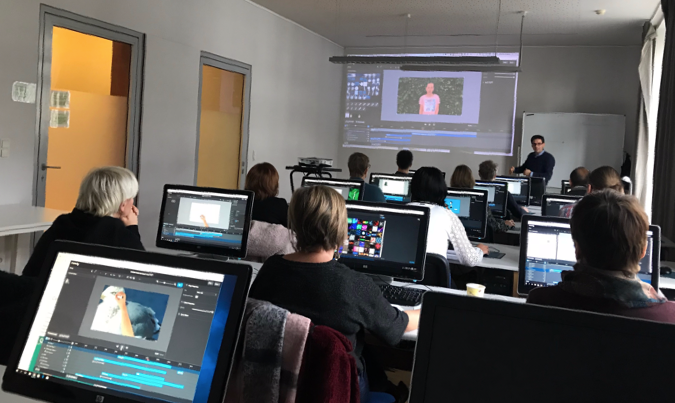 At the end of a workshop, when Moovly videos are ready, a final step is often to download or publish the videos created. This involves a render process on Moovly's servers. Please be aware that rendering takes time, depending on the size and complexity of the video, but also on the requested quality (SD versus HD). If you like to show the final videos in the classroom, ask students to share their Moovs with you using the internal Moovly Share function and show them from your account in preview mode. If you are using a computer lab with desktop computers, but even when everyone brings their own laptop, pay attention to browser settings that may affect proper functioning of Moovly as a browser-based application. Depending on previous browser use, installed plugins or cache may sometimes interfere with Moovly. This FAQ about browser settings provides a few additional tips.